I am referring to the one Jesus gave his disciples before he died, that he would send the Holy Spirit, the comforter, the one which dwells in us when we make that commitment to God. Hazel has choosen the theme for the week and has written about it here. Please take a look at the inspiring pieces of work. Here is a quick card on the theme. I am currently living in a half packed house as we prepare to move. We are moving within the town so not going to far, however we have lived in this house nearly 9 years and we've accumalated, increased in number and have widened our hobbies and interests (well I have!). 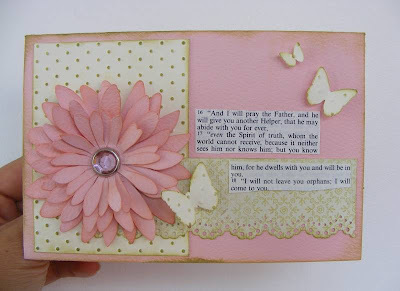 Sizzix bigz daisy die, Martha Stewart butterfly and doily lace punches, Cuttlebug swiss dots embossing folder, Dove Craft gem brad, paper by K and Co and cut out verse from an old Bible. Ironically I don't feel like I have been putting God first lately. And this has been the theme of the latest Salt challenge. Please look here for the thoughts Tanis has written on this subject. Please meditate on them and maybe create a piece of art to help you to remember to put God first. I bought a couple of oversized clothes pegs in a craft shop last year, they're such fun to have in the house, they're useful for all sorts of things! Thought it would be nice to decorate one to be reminded of seeking God's kingdom first. Paper by K and Co, butterfly punch by Martha Stewart.